The gateway to RegulationSpotter is our Query Engine. Here, you can upload any standard VCF 4.1 file for analysis with RegulationSpotter. Note that the chromosomal positions have to relate to GRCh37. Please also note that asterisks (*) standing for a deleted allele in VCF 4.2 are currently not analysed. For a tutorial on how to use the Query engine please click here. Tick this box if you want to only consider homozygous variants in your analysis. Enter a threshold for discarding variants as polymorphisms using the frequency observed in 1000G and ExAC. The default filtering is 4 for homozygous in 1000G and 10 for homozygous in ExAC. It is also possible to filter for variants present in any form (heterozygous and homozygous) as defined in the second row in case of non-recessive traits. Set both values to zero if you do not wish any filtering. All values refer to the number of individuals with the specific allele setup. Enter the minimum value for your variant's coverage. The default is 4. Select whether you wish to analyse the entire VCF file, or custom regions or genes. This can also be done after analysing the complete vcf file upon restricting the display of analysis results to variants residing in certain candidate genes or regions. There is no difference between the two filter options regarding the output. However, speed of the analysis is usually increased if the restriction to certain genes / regions is already selected ahead of the analysis. On the other hand, users are free to select / deselect different gene panels after the analysis if they initially do not exclude any variants. A page similiar to this page will appear after RegulationSpotter is done with its analysis. You can navigate to a synopsis of your analysis here as well as filter and sort your results. The project ID allocated by RegulationSpotter. It is used in the URL to enter your project results. If you wish to easily access your results later on, you can note the URL and the project ID. Please do not delete or alter the project ID in the text field on the results page. A synopsis of submitted and analysed variants can be shown on demand by clicking on the show / hide statistics link at the top and bottom of the page. Most often, RegulationSpotter will not analyse each and every line of your VCF file, either because you have set certain filters, or because certain variants were not suitable for analysis with RegulationSpotter. The synopsis gives you an idea of how your analysis went. Number of alterations (lines) in VCF file. Number of variants which were filtered out according to user input (below coverage, not homozygous, out of specified region / chromosome) or due to input / format errors (e.g. variant equals refseq, reference allele equals alternative allele, Indel is too long or neither genotype nor frequency are supplied). Variants localised in a protein-coding transcript, which were analysed with MutationTaster for evaluation of effects on the protein, as well as by RegulationSpotter, to account for possible regulatory impact of intratranscriptic variants. The lines following this subheading give information about different types of variants and predictions made by MutationTaster. The sum of all predictions made by MutationTaster are usually significantly more than the analysable variants, because for most variants more than one (suitable) transcript will be found. The type of prediction algorithm used by MutationTaster. without_aae: our algorithm for silent alterations. simple_aae: our algorithm for simple amino acid exchanges (one amino acid exchanged by another). complex_aae: the algorithm for amino acid exchanges involving more than a simple exchange of one residue. disease_causing automatic: known to be disease-causing from databases (currently ClinVar). disease_causing: probably deleterious. MutationTaster classified the alteration as disease-causing. polymorphism: probably harmless. MutationTaster classified the alteration as a polymorphism. polymorphism_automatic: known to be harmless from databases (currently 1000G and ExAC). More information on the classifications can be found in MutationTaster's documentation. Number of variants which are located outside of protein-coding transcripts and analysed exclusively by RegulationSpotter. Please note: The sum of intratranscriptic variants plus extratranscriptic variants is not necessarily identical to the number of all variants minus the discarded alleles because one line in the vcf file can contain more than one alternative allele which are all individually counted if discarded. To make your analyses as convenient as possible, RegulationSpotter offers great flexibility in the results display. Select whether you wish to display variants from the entire VCF file, or custom regions or genes. The restriction to candidate regions or genes can also be done before analysing the complete vcf file. There is no difference between the two filter options regarding the output. However, analysis is usually speed up if the restriction to certain genes is chosen already ahead of analysis. On the other hand, users are free to select / deselect different gene panels after the analysis if they initially do not exclude any variants. After analysis, it is also possible to select candidate genes by entering symptoms or diseases from the HPO, OMIM or OrphaNet. Afterwards, RegulationSpotter will automatically suggest candidate genes associated with the entered symptoms / diseases. You can enter diseases or symoptoms relevant for the case that you are analysing. As soon as you are typing, autocompletion will suggest relevant terms / entries from the HPO, OMIM and Orphanet. Tick the diseases and symptoms of your choice. Then hit the "find suitable genes" button and RegulationSpotter will automatically suggest candidate genes which are known to be associated with the selected diseases or symptoms. A cut-off for gene search can be adjusted. The default is 70%; lowering this value will result in the suggestion of more candidate genes (and more noise), increasing this value will lead to the suggestion of fewer, but highly relevant candidate genes. If you enter candidate genes in this text area, RegulationSpotter will only display the analysis results for variants localised within the chose candidate genes or their regulatory regions (including distant enhancers,) given they are annotated). If you enter candidate regions in this text area, RegulationSpotter will only display the analysis results for variants localised within these regions. 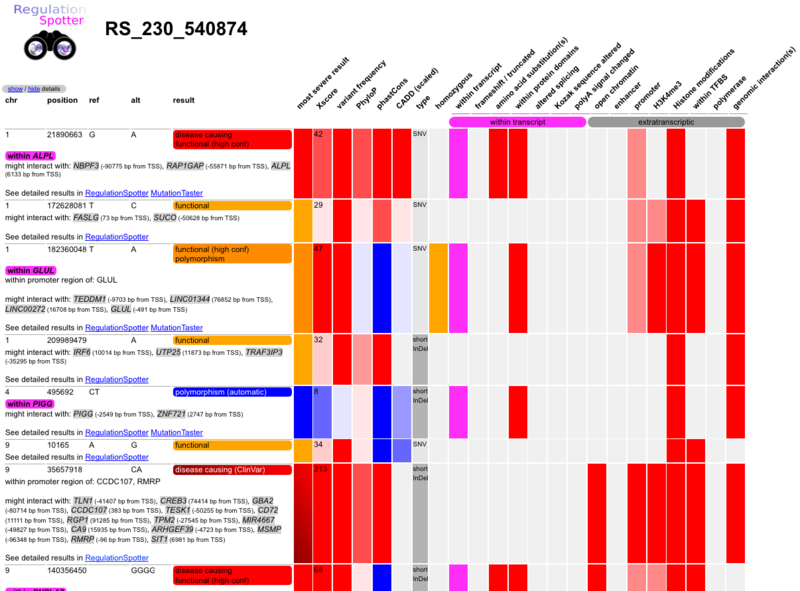 Choose if you want to display all analyses made by RegulationSpotter and MutationTaster, or only a selection. The default setting is the display of analysis results from both tools. 'show intragenic vars' - remove the tick if you do not want to inspect MutationTaster analysis results for variants located within protein-coding genes. 'show extratranscriptic vars' - remove the tick if you do not want to inspect RegulationSpotter analysis results. Choose if you want to prevent certain variants from being displayed, beause they are at least in the first place rather unlikely to be involved in the onset of disease. silent intragenic variants: variants located within protein-coding genes but without direct effect on the amino acid sequence. Some of these 'silent' variants can nevertheless be disease-relevant, however, in a first, rigid filter strategy they are usually left out. prediction problems: any kind of MutationTaster prediction problems. If you have already thoroughly inspected all analysis results without finding promising variants, it might be worth it to inspect the variants with prediction problems. This section allows you to sort your results by various properties. By default, they are displayed by effect first, followed by position and effect. Finally, just click on the big 'display' button to get a look at your results. export this project: export all analysis results in tab-separatet flat file format. The zip-archive contains a readme file explaining the different columns in the export file. Filter options do not work for export. We plan to offer additional export functions and formats in the near future. keep this project: click here if you want your project to be kept available longer than the default of 3 weeks. Once you have chosen this option, deletion via the adjacent link is not possible anymore. If you want to delete your formerly marked as "keep" project, please drop us an E-Mail and we will delete your data on demand. delete this project: click here if you want to delete your project. If you do not choose to delete your project, it will nevertheless automatically be deleted after 3 weeks. Screenshot of the results overview output of RegulationSpotter. Upon displaying your results, RegulationSpotter gives you a summary table of your results. Here, you can find each variant together with crucial information such as the gene it is associated with, the type of alteration etc. This table serves to give you a quick graphical overview on each variant and its effect. Affected regulatory features are indicated in a colour-coded fashion. For non-dichotonous data: The stronger a colour is, the more affected a feature might be. Information on the location and nature of the alteration. disease causing (ClinVar): known disease mutation listed in ClinVar. disease causing: predicted by MutationTaster as disease causing. polymorphism: predicted by MutationTaster as harmless. polymorphism automatic: known to be harmless from databases. functional region (much evidence): Regulatory information is available for the variant's location in several data sources, resulting in a high Region Score which makes it principally possible to classify this variant as "functional" with high confidence. The confidence was drawn from testing the distribution of Region Scores for a set of known extratranscriptic disease variants and known harmless extratranscriptic variants with a high frequency of homozygous occurence in the data of 1000G. Due to the available data, RegulationSpotter considers it vary likely for the variant to have a regulatory function. The high confidence label is given to variants for which the positive predictive value (PPV) was at least 98% and the negative predictive value (NPV) was below 98%. functional region: Regulatory information is available for the variant's location which leads to a high Region Score. Due to the available data, RegulationSpotter considers it possible for the variant to have a regulatory function. non-functional region: Low Region Score which makes it rather unlikely that this variant is located in a regulatory region and plays a functional role. Due to the available data, RegulationSpotter considers the variant to be not located in a regulatory region. For the high confidence label, the same thresholds as for functional variants were used. non-functional region (much evidence): Very low Region Score which makes it very unlikely that this variant is located in a regulatory region and thus this variant is very likely not functional in terms of gene regulation. polymorphism: The variant was found in homozygous state in several samples in the data from 1000G or ExAC which is indicative of a harmless polymorphism. The second part of the results table is displayed in a colour-coded matrix. For various properties, each column gives an indication on the severity of the alteration and on its likelihood to be located in a regulatory region. Less transparency signifies a higher indication for a regulatory function/functional impact. Most severe RegulationSpotter result for all available transcripts, will be used for sorting. RegulationSpotter score for the variant's location. The score integrates all found evidence for the functionality of the variant. Higher values indicate a higher probability of functionality. Type of alteration: Single nucleotide variant (SNV), Insertion/Deletion (InDel). InDels can be long (>10 bp) or short. Indicates whether the variant is located within a gene. Displays whether an amino acid exchange occurs. Indicates whether the variant is located within a protein domain. Indicates whether the variant leads to the alteration of a splice site. Indicates whether the variant leads to the alteration of a Kozak sequence. Indicates whether the variant leads to the alteration of a poly-A signal. Indicates whether the variant leads to the alteration of a miRNA binding site. Indicates whether the variant is located within an open chromatin section. Indicates whether an enhancer is annotated for the variant. Indicates whether the variant is located within a H3K4me3 positive region indicative for active transcription. Robust indicates that these annotations were available for at least three different cell lines. Histone modification annotations from Ensembl at the site of interest. Indicates whether the variant is located within a transcription factor binding site (TFBS) from Ensembl . Polymerase II and III binding sites annotated for the region. Indicates the highest PhyloP  and PhastCons  scores, respectively. Indicates the scaled CADD score for the alteration. Variant frequency in dbSNP and 1000G. Unknown/rare alleles are marked with a bright red colour. Clicking on the blue "extragenic results" oder "intragenic results" link of a variant leads you to more detailed insight into the results for a single variant. For intragenic alterations and known disease causing variants, you will be redirected you to our conventional MutationTaster output. More information can be found in the MutationTaster documentation. For the detailed explanation of an extragenic result please visit the single query documentation, where you can also find an explanation of the interaction plot. Dominik Seelow ( dominik.seelow AT charite.de). We also appreciate hearing about your general experiences using RegulationSpotter.